Well, it appears that food critic/radio show host Allen Borgen and Dine 909 have something in common…our love for Mill Creek Cattle Company in Redlands. Allen’s review hits the pages of the Sun and the Daily Bulletin today, and he gives it an astounding 4 stars out of 5. Wow! I think he liked it even more than we did. I’ve been back to Mill Creek several times since I did my initial review, and have had a great experience each time. I’ve tried a couple of their sandwiches, one of their breakfast burritos and, out of curiosity, their chili cheese fries. I really appreciate restaurants that serve breakfast all day, and Mill Creek is one of those. If you like BBQ, do yourself a favor and check them out if you haven’t already done so. If you, like me, are not a huge BBQ fan, don’t despair, they have plenty of other treats there as well. Not to be forgotten, also appearing in today’s Sun and Bulletin is Elaine Lehman’s review of Rancho Cucamonga’s Stuft Pizza Cafe. Elaine tried an 8-inch sub filled with cheese, veggies and Italian meats, along with a salad and a soda, all for only $6.25. Sounds like a really good deal and a great alternative to Subway/Togo’s/Quiznos. You can read Elaine’s review here. So I was poking around the Dine 909 Twitter account, seeing who was following us, and ended up wandering over to fresh & easy’s Web site. I went, as I usually do, to their Inland Empire locations page to check on the status of their long-delayed stores in Loma Linda, Rancho Cucamonga and Rialto. Nothing new on those sites: The Loma Linda store is completed and is basically a fresh & easy-sized advertisement for fresh & easy. The Rancho Cucamonga store is hiring, but I know for a fact that they’re still working on the interior of the store. The Rialto store is also complete and it looks like the nearby Walgreens is ready to open. The surprise? They’re opening a store at Highland and Del Rosa avenues right here in San Bernardino. The actual address is 1631 E. Highland Ave. Apparently, it’s going in the same center as dd’s discounts, another lower-cased corporate entity. As with the Rancho Cucamonga store, they’re hiring. Normally, I don’t like surprises. This one I was all in favor of. Denny’s and local Avon representatives are teaming up to help “Slam Out” breast cancer this week. From 6 a.m. to 2 p.m. to tomorrow (July 29) at the LaVerne Denny’s and from 4:30 to 7:30 p.m. Friday (July 31) at the Claremont Denny’s, the restaurants will donate 20% of your meal to the Avon Breast Cancer Crusade. To participate, mention “Avon” during your visit, or print out the fliers for either the LaVerne or Claremont event. You’re also invited to wear pink to show your support. The LaVerne Denny’s is at 919 Foothill Blvd., just north of the 210. The Claremont Denny’s is at 820 S. Indian Hill Blvd., just south of the 10. The Avon Breast Cancer Crusade is part of the Avon Foundation, which also currently focuses on domestic violence awareness and emergency relief. If I were you, though, I’d steer clear of the Moons Over My Hammy, the Super Bird and the Meat Lover’s Scramble. I hear they’re very high in sodium. Besides, what’s wrong with a little high blood pressure if it’s for a good cause, right? Had the Panko Crusted Chicken Sandwich, something that wasn’t offered on the preview lunch menu, and was eager to try. It was very flavorful, and the shoestring fries were delicious. The only drawback was the ciabatta roll was hard in spots, probably due to the fact that it was toasted….a little too much. All in all, though, a very pleasant dining experience. Handel’s $1 cone day is here! Well, not exactly here, meaning right now, but here, as in tomorrow. 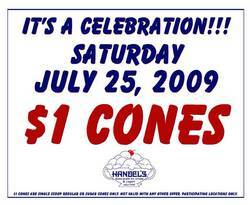 That’s right, Saturday, July 25, is $1 cone day at Dine 909 favorite Handel’s Ice Cream. Hooray! The deal applies to single-scoop sugar or regular cones, and no surprise, is not valid with any other offer. Couldn’t get a hold of anyone at the Upland store (373 S. Mountain Ave., at Seventh Street) to verify that they are participating, but I’ve never had a problem before, and they regularly have $1 cones on Wednesdays anyway. But who wants to wait for Wednesday? I’m thinking we’re all in for a cheap sweet treat tomorrow! How refreshing…100 flavors from one soda fountain! Of course, it’s not coming to the Inland Empire right away. It is, however, going to be in Southern California very soon. Coca-Cola is testing its new Freestyle soda fountain at several locations in San Diego and Orange counties. Why not Riverside and San Bernardino counties, Coke marketing decision-makers? Hmm? Anyway, the new dispenser has a touchscreen that allows you to select your base beverage and then choose a variety of that beverage. You want a raspberry Coke? No problem. Peach Dasani water? Lime Fanta? Grape Vault? Lemon Diet Coke? Minute Maid Light orange Lemonade? Just plain Barq’s root beer? The new machine uses highly concentrated flavors and micro-dosing technology, originally used to precisely dispense dialysis and cancer drugs. It is also highly customizable, allowing for new recipes to be downloaded as needed. I, for one, am looking forward to choosing a new soda flavor using the Freestyle. Follow the jump for a video demonstration of the new fountain and a list of upcoming locations where you’ll soon be able to make your own concoctions. Mexican restaurant that took over Margarita Beach. better than the very hidden one near the JCPenney outlet. This past Thursday, Dine 909 was part of a select group of people invited to preview the new Eureka!Burger in Redlands. Eureka!Burger (their spelling) moved into the location last held by Charo Chicken, at the corner of Eureka Street and Pearl Avenue. The sneak previews were held Wednesday and Thursday to show off the new gourmet burger restaurant, the brainchild of Executive Chef Ron Guidone and Managing Partner Nick Fontova. Guidone is also chef and owner of Talia’s and Mangiamo in Manhattan Beach. I sampled the Memphis Southern Fried Chicken Salad and the Caesar Salad Burger, along with orders of Panko Crusted Onion Rings and Sweet Honey Cinnamon Potato Fries. For as packed as the restaurant was, the food arrived very quickly. I was less enamored of the salad than the burger, which was very flavorful. The onion rings were cooked to perfection, but needed…something. Perhaps some bleu cheese dressing to dip them in. The sweet potato fries were good, but I think Mill Creek has them beat by a hair. Portions were good…I was full the rest of the day from splitting the salad, burger, fries and rings. Burger buns, ciabatta rolls and some of the desserts are being provided by the folks over at West Coast Whoopies in Calimesa. 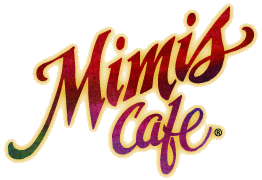 Mimi’s Cafe is continuing its recent tradition of refreshing its existing locations and handing out scads of gift cards after having done so. Get ready, because on Thursday (July 16), Mimi’s is re-opens its Chino restaurant. As with previous “Meet Me at Mimi’s” events in San Bernardino, Fontana, Upland and Corona, they’ll be bestowing $3,000 in Mimi’s gift cards to the first 75 adults in line. line, $50 the next 15, and $25 to the next 50, for a total of $3,000. I highly doubt Thursday’s offering will be any different. The event begins at 9 a.m. with a ribbon-cutting with the fine folks from the Chino Chamber of Commerce, but you’ll want to get in line way before that. Trust me. The newly “reimaged” (their term) Chino Mimi’s Cafe will have a new look and a full bar. I highly recommend the Margaritas, but not at 9 a.m. The Chino Mimi’s Cafe is at 3890 Grand Ave. Restaurant hours are 7 a.m. to 11 p.m. every day Friday and Saturday and 7 a.m. to 10 p.m. the rest of the week.